Editor’s note: In a previous version of this story, a sentence indicated that 50 people at the event were wearing pro-Trump and pro-NRA attire. This is incorrect, as many people were wearing plainclothes. Also in a previous version of this story, a statistic from Every Town for Gun Safety was included that has since been removed. Additionally, due to an editing error, a quote from Ragosta in the middle of this story lacked the appropriate context. It has been removed. In an event billed as an educational program on the same night as the Vice Presidential Debate, the Pitt College Republicans hosted representatives from the National Rifle Association to discuss Second Amendment rights. 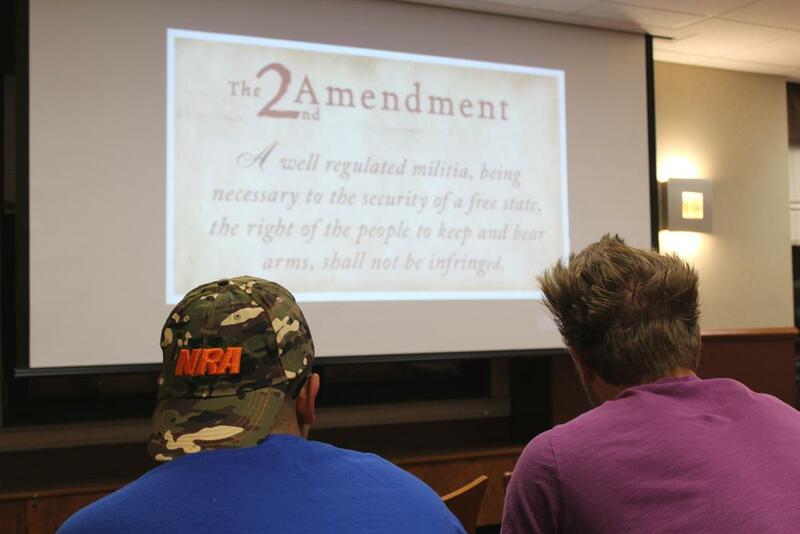 About 50 people attended a presentation in the William Pitt Union to hear a seminar on gun rights, legislative threats to those rights and gun safety. Though the Pitt College Republicans hosted the event, the event was not explicitly billed as a political event and speakers did not mention specific candidates or the election during their presentations. Christian Ragosta, an NRA grassroots field coordinator for the Northeast region, led the seminar, which encouraged students to know and exercise their rights and also discussed the outcome of increased gun legislation. Although Ragosta said he was unable to comment personally on any issues relating to the topics discussed, he emphasized during his lecture the need for Americans not only to carry firearms but also to be responsible with those weapons. Throughout the election, Republican presidential candidate Donald Trump has touted the NRA as a close ally, promising his supporters that he would protect their rights to own guns while saying Hillary Clinton, his opponent, would take those rights away. At the Republican National Convention, for example, the NRA’s chief political strategist Chris Cox delivered a fierce testimonial for Trump. In 2007, the NRA-Institute for Legislative Action — a subset of the NRA — launched NRA U, because it believed not enough college students were educated on their Second Amendment rights or the NRA’s ideas, according to the NRA’s website. Since its foundation nine years ago, NRA U has held similar seminars over 120 times in 16 states. Some students on Pitt’s campus simply wanted to learn more about the policies and laws regarding firearms. Harley McCain, a junior environmental science major, said she attended the lecture for her own personal education. “I’m a Republican, and I [was] curious to see what they say about gun policies so I can have more educated arguments,” McCain said. Ashley Ward-Willis, a sophomore political science major, said she attended the event because she hoped learning more about her Second Amendment rights would allow her to have more educated and validated opinions. Partway through his lecture, Ragosta pulled a map of the United States onto the screen with each state highlighted in either red, white or blue. The states highlighted blue allow individuals to carry firearms on college campuses, the states in red do not and the states in white — including Pennsylvania — have no clear legislation on the topic. Ragosta said Pennsylvania law does not specifically allow or prohibit either open or concealed carry of firearms on campuses. According to the National Conference of State Legislators, Pennsylvania is among 23 states that does not specifically prohibit the concealed carry of firearms on college campuses but allows individual universities to make that decision. Ragosta said during his lecture that it is important for individuals to be educated about their rights so they can fight back against anyone trying to take those rights away. Citing statistics from the FBI, Ragosta said only 0.2 percent of accidental deaths are the result of firearms, while nearly 2 percent of accidental deaths are the result of drowning. Ragosta stated that 15 out of the last 20 mass shootings in the United States have occurred in gun-free zones, or GFZs, which would indicate banning firearms does not reduce gun violence. Toward the end of the seminar, Ragosta offered ways in which students can get more involved in the NRA and in student education, such as building pro-gun coalitions on campus, facilitating events like NRA U and tabling on campus. Ragosta also encouraged attendees to complete an application at the end of the event to receive a free one-year NRA membership.